The Canadian Anesthesiologists' Society (CAS) will be holding their annual meeting this June in the Nation's capital, Ottawa, Ontario. Each year the CAS formally recognizes its award winners’ accomplishments and contributions to anesthesiology during the CAS Annual Meeting. In 2015, the ceremony will take place in Ottawa on Monday, June 22 at 14:00. The highest honour in awards for the CAS is the Gold Medal, which is why we are thrilled to announce that our Department Chair and Chief, Dr. Davy Cheng, will be this year's recipient. Dr. Cheng is recognized as a world expert in perioperative outcomes and resource utilization in cardiac surgery/anesthesia, blood management, minimally invasive and robotic cardiac surgery, and perioperative evidence-based medicine. His pioneer work in fast track cardiac anesthesia and recovery has become the standard of cardiac anesthesia and recovery practice around the world. 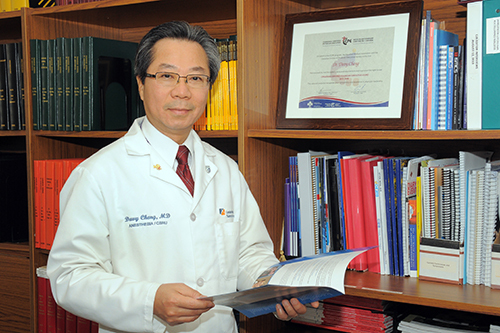 Dr. Cheng established the Evidence-Based Perioperative Clinical Outcomes Research Group (EPiCOR) and the MEDICI Centre (Medical Evidence, Decision Integrity, Clinical Impact) at Western and the London Teaching Hospitals, and continues to release a number of pivotal publications to direct evidence-based medical and surgical practices. He is a recognized healthcare leader in the forefront of research, practice and healthcare policy. As Principal Investigator and Co-investigator, Dr. Cheng has been awarded over $5.8M in peer-reviewed grants and over $1.6M in non-peer reviewed grants. He has published over 144 peer-reviewed scientific papers in high impact journals and 45 book / chapters (h-index 43, i10-index 101). Dr. Cheng holds positions on several Editorial Boards including; anesthesia (CJA), cardiothoracic and vascular anesthesia (JCTVA) and cardiac surgery (INNOVATIONS). He Co-Chaired the Steering Committee and Expert Consensus Panel for the International Society for Minimally Invasive Cardiac Surgery (ISMICS) as well as the European Association of Cardiothoracic Society (EACTS) in practice guideline development. Dr. Cheng has been invited as a Visiting Professor to over 95 Universities, Cardiac Centers and Conferences nationally and internationally. Please join us in congratulating Dr. Cheng as he is recognized for his outstanding contributions in leadership and professional and clinical excellence in anesthesia.